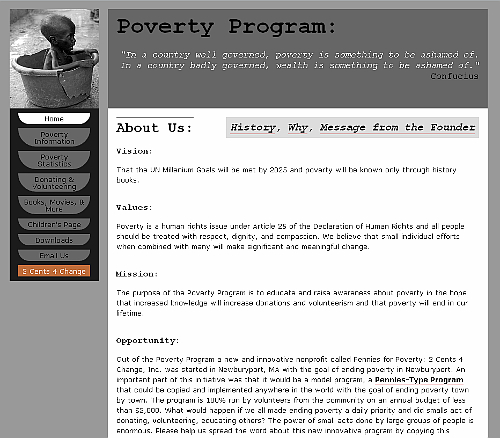 "Tatiana's design for the new Poverty Program website was beautiful in its simplicity, reflecting the seriousness of the topic. The new site is easy to use and with the great amount of information, it is easy to find what you're looking for. "Tatiana Hamboyan Harrison is very professional and easy to work with; responds promptly, quickly, efficiently to all requests; is creative and competent in her design and web skills; has made thoughtful and meaningful suggestions to improve the websites; goes beyond what she is contracted to do; reasonable fees; both websites are well-used and easy to navigate. Would highly recommend her for website design and webmistress." "My name is Sarah and I am an after-school counselor out in Colorado. My students have been using your webpage and brought to my attention how helpful it has been for them for their Global Warming project! We would like to thank you again for the wonderful resources." In October of 2011, this website was completely redesigned. The main goal for the redesign was to make the website easier to navigate. This was accomplished primarily by including the entire website menu in the sitemap and using fixed positioning on the main menu to keep it always in the same location on the screen. 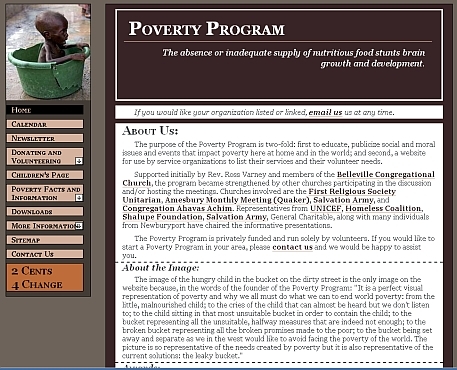 Catherine Gould approached me to design a website for her new poverty-education program. This design's color scheme was based on the logo for the program. Because this site contains so many pages, its unique challenge was navigation. Below is a picture of the original design.